“Everyone should see these images to see how terrible out species is,” says Brazilian photography Sebastião Salgado as he reviews the photographs that he has taken throughout his career. It has been a career that has been inspired by an intense social conscience, a fierce and bold curiosity, and an eye for beauty and the arresting image that can actually change the conditions he seeks to record. German film maker Wim Wenders came to The Salt of the Earth (2014) as a fan of Salgrado having purchased a print of his some years ago. Salgado’s son Juliano, who is Wenders’ co-director, had already begun filming his father, and the seventy-year-old photographer proves as fascinating as his art. Wenders and his small film crew follow the wiry old man as he stalks around his own subjects in the middle of the rain forest, or hunting a wildlife shot on the edges of the Arctic sea, with the photographer occasionally turning to snap a picture of the film crew. “I got a good picture of you,” he tells Wenders. Salgado started life as an economist, working for the World Bank and travelling extensively under their aegis, taking up photography as a hobby. But having met the love of his life, Lélia Wanick, she encouraged him to take photography more seriously and he soon quit and started his career as a social photographer traversing the globe, sometimes with his young family in tow, and capturing lives in often remote and extreme circumstances. Having explored the North Eastern part of his native Brazil, Salgado travelled to Sahel in Africa, his work was published in 1986, and he would continue to document years of famine and drought there and in Ethiopia and Sudan throughout the 1980s. The despair and suffering are sometimes too much for the old man as he peers at his photographs – Wenders projects them onto a screen and films Salgado through the glass so that he gazes right at the camera as he examines his work. “The number of times I had to lower the camera because I was weeping,” he says. Inspired by his insight into suffering, Salgado and his wife meticulously plan further projects. One entitled Workers come as partly a social document and partly a paean to the women and men who have built the world around us. Another called Kuwait shows the aftermath of the first Gulf War when Saddam’s retreating army set fire to hundreds of oil wells, an event that was also filmed by Werner Herzog in his poetic film Lessons of Darkness (1995). However, the toll to Salgado begins to tell when he explores the plight of refugees which in turn takes him to Rwanda and the Congo and the sites of genocidal murder, including a school room with the chalk writing of the day’s lesson on the blackboard and bones and skulls filling the floor of the victims. “No one deserves to live,” Salgado says, but again it is his wife Leila who proves his most valuable collaborator. Returning to Brazil, she has the idea of reclaiming the exploited and drought ravaged landscape of his father’s farm and re-planting rain forest. Her project has thrived and is now a National Park and a model for conservation and re-wilding. This has also inspired a late change in subject matter with Salgado turning his attention to the planet itself and in Genesis creating something of a love letter to the planet, and its flora and fauna. 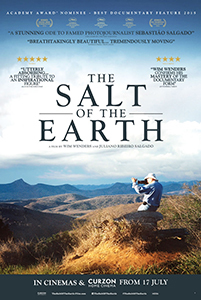 The Salt of the Earth is a glowing tribute to a committed and admirable artist. Wenders makes no attempt to critique or challenge his subject, and is content to let Salgado and his camera speak for themselves. And speak they do.